Philodendrons are either a none climbing plant or a climbing vine. Many Philodendron species and cultivars are plants that can be used as an indoor plant as well as in the garden. They make an excellent addition to a tropical look garden. And although they are best suited to warmer climates, they can be grown in cooler areas given a little care and attention. If you are looking for large and luxurious foliage plants, for indoors or outdoors then Philodendrons could be the ones. Both species and hybrids are used widely as indoor plants as well as in the garden mainly as a tropical foliage plant with Philodendron Xanadu and Philodendron selloum being popular. 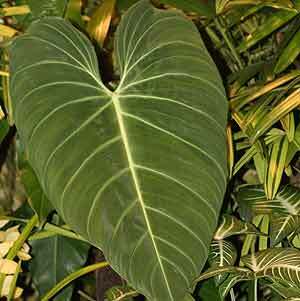 Many species are climbing plants and Philodendrons do well in low light situations. Being a tropical plant they do need protection from frost, however they do well indoors or on a patio. If you are lucky enough to have a sheltered warm frost free position outdoors, then even in temperate climates they are well worth a try. For those in cooler climates you could try Monstera deliciosa which is sometimes mistakenly called the ‘Split Leaf Philodendron’. Preferring filtered or ‘indirect’ light and a humus rich moist growing medium (buy well drained) Philodendrons also like humidity. When grown indoors the only real problem is overwatering (soggy soil) or under watering. Over fertilisation can cause leaf burn, a general purpose slow release fertiliser seems to work well. Well drained potting mix that will retain moisture. Prune away old dead foliage to maintain appearance. You can grow Philodendrons from seed, however seed is difficult to come by and you may need to hand pollinate flowers to obtain some. For commercial growers the main method of propagation is by tissue culture. Also possible from cuttings. 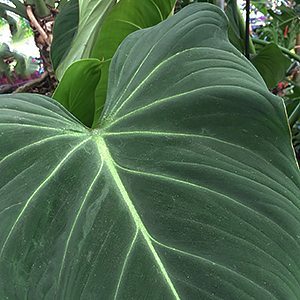 Philodendron ‘Xanadu’ a lovely tropical foliage plant that grows well in a pot or in the ground in warmer areas. Philodendron bipinnatifidum (Philodendron selloum) has a finer or ‘lacy foliage’ compared to some others, commonly called the ‘Split Leaf Philodendron..
Philodendron scandens with its heart shaped foliage. Philodendron Congo and Philodendron cordatum and are other species worth looking for.